Chennai: It was the morning of July 15, 1953. 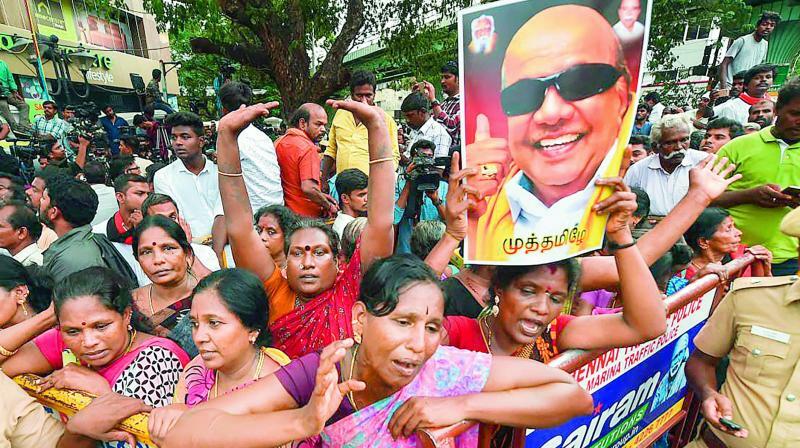 Dravida Munnetra Kazhagam (DMK) members had launched a protest against the renaming of Kallakudi to Dalmiyapuram, near Trichy, named after industrialist Dalmiya who had set up a cement factory in the town. Amid the thunderous anti-Hindi slogans, as the members were busy erasing the Hindi name board at the railway station, a man of less than 30 years holding a black flag, along with four others, jumped off the platform and laid down on the track in front of a moving train. The young curly haired man wearing a black shirt was fined ₹ 35 and sentenced to five months in prison. He refused to pay the penalty, stayed in prison for more than a year and since then came to be known as ‘Kallakudi konda Karunanidhi’ (Karunanidhi who won Kallakudi). Though Muthuvel Karunanidhi had established himself as a key member of the Dravidian party through his oratorical and screen-writing skills, the Kallakudi agitation was a turning point in his political life. Born on June 3, 1924 at Thirukkuvalai into a family of Nadaswaram exponents who had traditionally played in temples, Karunanidhi, who was inclined towards Periyar E.V. Ramasamy’s atheism and rationalism, joined his self-respect movement as a teenager. It is often said that he was just 14 when he became actively involved in politics inspired by the speeches of Alagirisamy of the Justice Party. Murasoli’s high point was its fierce and principled opposition to the Emergency when it carried a cartoon that depicted Indira Gandhi as Adolf Hitler, which was later picked up and published by Newsweek. When C.N. Annadurai broke away from Periyar’s Dravida Kazhagam to start the DMK in 1949, Karunanidhi joined him. Fondly known as Kalaignar (scholar/artist), Karunanidhi began his career as a screenplay writer for Tamil films in the 1940s. Parasakthi, a successful play written by Pavalar Balasundaram, was penned for the screen by Karunanidhi in 1952. The movie did not just have an immense impact on Tamil cinema, but also enormously influenced Tamil Nadu’s political scene. An 18-year-old Karunanidhi started publishing handwritten notices called Murasoli, under the pen name Cheran, while World War II was underway. Since then, Murasoli played a significant role in advancing causes championed by Periyar E.V. Ramasamy’s Dravidian movement and later in nurturing the DMK as a political party through the writings of C.N. Annadurai and Karunanidhi. With Sivaji Ganesan making his debut, it marked the beginning of a new era. The dialogues in chaste Tamil espoused with Dravidian ideology became an element of Tamil political history and it was also a landmark for many other movies to use cinema as a tool for Dravidian politics. When the DMK entered the electoral fray in 1957 with demands for Dravidanadu—secession from India—the party was still unrecognised, but 33-year-old Karunanidhi won from Kulithalai constituency. Of the 15 elections held in Tamil Nadu since Independence, the DMK veteran faced 13 and lost none. After DMK’s first election, Karunanidhi was promoted as the treasurer of the party in 1961 and became the deputy leader of Opposition in 1962. When DMK led by Annadurai came to power in 1967, Karunanidhi was made the minister for public works department. He was elevated as the chief minister following Annadurai’s death in 1969. The transition from Annadurai to Karunanidhi is a rallying point not just for the DMK, but also for the state’s politics. After Annadurai’s demise, V.R. Neduncheziyan was a natural choice for successor and was made the acting chief minister. However, the astute caliber of Karunanidhi helped him outwit Neduncheziyan. His smart and uncanny political maneuvering aided in sustaining himself and also gave a new thrust to the DMK. Almost half a century ago, the DMK in its conference at Trichy in February 1970 floated one of its most popular slogans “Maanilathile Suyatchi, Mathiyile Kootatchi” (Autonomy for states; federalism at the Centre), in an attempt to continue party founder Annadurai’s demand to restructure Centre-state relations and to staunchly resist any attempt that infringed the state’s prerogatives. Continuing Annadurai’s argument that an ideal Centre is the one which left sufficient powers with the states and kept just enough power with itself to protect the integrity and sovereignty of the country, Karunanidhi continued to work on the footsteps of his predecessor. In 1974, about 14 years before the Union government’s Sarkaria Commission studied Centre-state relations, the DMK government under Karunanidhi passed a resolution in the Tamil Nadu Assembly on state autonomy based on the recommendations of the Rajamannar Committee. It urged the Centre to make “immediate changes in the Constitution of India to establish a truly federal set-up with full state autonomy”. Terming the 1974 resolution as a very significant one in Indian politics, since the adoption of the Indian Constitution, Tamil writer and translator Aazhi Senthilnathan said that the 1970-75 period in Tamil Nadu, with Karunanidhi as the chief minister, could be called “the golden period, especially for reinforcing the idea of state autonomy, which became the political theory in Tamil Nadu”. Karunanidhi, who was demanding a separate state flag for Tamil Nadu since 1970, ensured that chief ministers of states’ who weren’t allowed to hoist the national flag during Independence Day celebrations until 1974, were given the right to do so. “However, after the 1990s when the DMK started talking about state rights instead of their initial state autonomy, things got diluted,” he said. The late 1980s saw Karunanidhi emerge as a successful strategist in coalition politics when he played a substantial role in the formation of National Front under V.P. Singh, after breaking ties with Congress in 1983 over the Sri Lankan Tamil issue. A regional party leader becoming indispensable in the national political sphere was something remarkable, said Senthilnathan. Posted August 7th, 2018 .